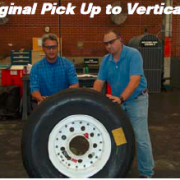 Aircraft Tire/Wheel shop activities require significant handling of large aircraft tires and rims weighing up to several hundred pounds. Handling these assets by manual means/methods had resulted in several serious injuries, culminating in lost work days and long-term medical impact on shop personnel and worker well-being. 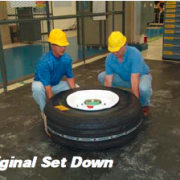 Original Process: Two to Three operators required to lift C5 aircraft tire from pallet position, stacked up to four(4) levels high and onto rim assembly. Assembly was then lifted from horizontal position to vertical in order to be rolled into rack staging area. Upon review of operations, AirPower solution consisting of aluminum overhead rail, bridge crane to suspend one (1) manipulator for the tire lift process, and one (1) bridge to suspend a pneumatic hoist for the F15 Rim process for the original C5 aircraft application. 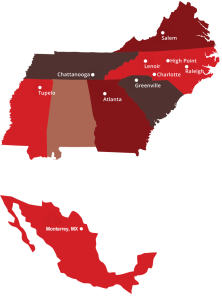 C5 Solution installed in 2013. Due to increase in the C130 aircraft process requirements, Air Power was contacted to provide an additional solution for the C130 unit in September 2015. An additional bridge was added, to allow processing for the larger C130 tire application (tires in excess of 400lbs) to allow pickup, positioning and processing of these components. Air Power Inc provided a TurnKey solution for both C5, and C130 tire applications. Implementation will reduce injuries, enhance efficiency, improve quality and ergonomics in the support of the war fighter mission. Customer installed new winders in a low headroom area which presented final product at a low pickup position. Rolls weighing 100lbs were required to be lifted from horizontal position, and placed into vertical stacked position onto pallet. Existing process required manual handling. 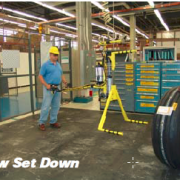 Area of equipment installation presented a restricted, low headroom area requiring the need to reach under, and around additional OEM equipment required for the winding process. Upon evaluation of process, and area requirements, a dual extruded aluminum runway, with low profile carriage and custom adjustable stops were specified, and installed to provide coverage for the pickup and placement of rolls across a bank of six(6) winding machines. A custom steel frame was fabricated and installed in order to properly mount/position both runways for roll handler, and aspirator lines for the winding equipment. Due to area restrictions, an articulating arm with integrated air balancer was mounted to allow for reach under, and around process equipment, to allow for pickup and placement of the finished product. A Dotec RH90Z45 Roll Handler (for low pickup) was provided which allows ergonomic pickup/placement of rolls to eliminate bending and manual handling by the operators of the finished product. 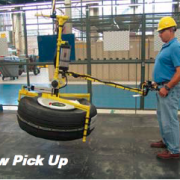 A Demonstration of the DOTEC Friendly Lift Assist Roll Handler. A demonstration of the Indeva Liftronic Easy intelligent material handling device. Thanks to the guys at Indeva for coming to Air Power, Inc. in High Point, NC to show us their new equipment!